As I teach my class, The Raven Innovation Lab (ROHS iTeam), I find many similarities that overlap with my own day-to-day activities on the job. I am tasking these students to be collaborative and team together in productive ways. What does that look like? How do we do that in order to get a result that meets their goals? How do we know we were successful? What are the success indicators? Then, of course, students have to practice effective communication skills- giving everyone a space to voice their perspective and making sure each member is heard. Practicing Empathy. Mindfulness. Understanding that 'failing forward' is ok, there may not be a "right" answer (there rarely is) and there aren't many careers in which you aren't managing multiple projects at once. We are working on many of the Approaches to Learning Skills. Honestly, by the act of just teaching, we are utilizing the Approaches to Learning Skills (at least some of them). However, I have to constantly remind myself to explicitly teach them to students and essentially tell myself to 'slow down.' It may be silly, but since I'm visual, I need visual reminders. I not only have to explicitly teach these skills... I feel like I need to lead by example. The things I ask of my students are the things I am constantly working on as well. Some of them will come naturally, but others I know I need to work on. I not only have to explicitly teach these skills... I feel like I need to lead by example. The Raven Innovation Lab is built on the foundation of Design Thinking. It's actually a big connector to design, engineering, science, and quite honestly I can make a case for its connection into every course that targets project based learning (PBL) in some way. It's a process, and in part, it's really a thinking process. I'm not educating students on memorizing the steps. I am educating them on intuitively navigating through problems and finding solutions. Would you say that all teachers do this? I totally would! As an instructional coach that moves around the PLC circuit, I am finding that we all have a different language. Why is that? This may be my own naivete, but why is 'thinking like a scientist' different than 'thinking like a writer,' or engineer, designer, artist, mathematician? The piece of the ATLs that I love is that it gets us to develop a common language. 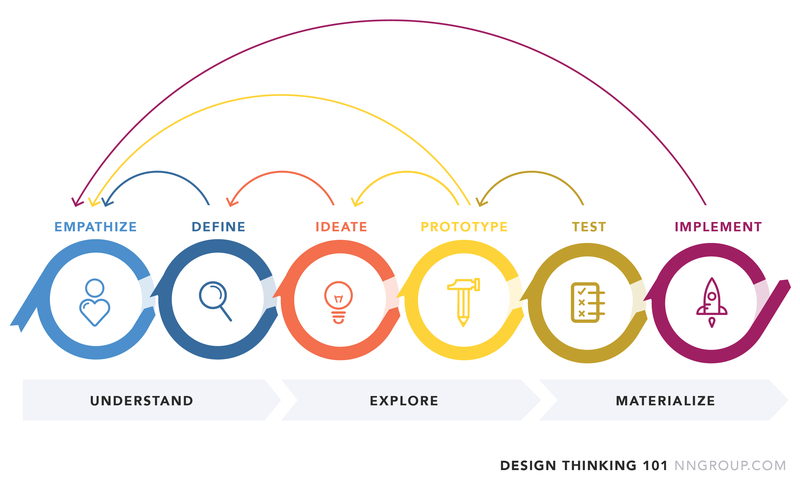 I started with the basis of Design Thinking because it's a cycle that I personally go through with all of the projects and problems I encounter, either at work or in my personal life. I said previously in this post that I need to slow down and explicitly teach some of the ATL skills. I would like for the big area of focus for the iTeam to be reflection. I think reflection is a huge part of learning and it's something I do every single day. I would like to think that I do a decent job about leading by example with regards to reflection. As I'm writing this blog post, I am hoping that my students are also reflecting on their week and their learning. I can't ask students to be reflective learners without being one myself. The design process I am asking students to go through is challenging for them. Mostly it's because they have to team and direct their own learning in some way. When asked to select a problem and address it with the given resources I was met with, "This is hard! If you give me the problem I could solve it." Yes, they totally could. We have students who are excellent writers, readers, designers, etc. In public education we give them many things and sometimes I think we forget that frustration and failure is not bad. They have to work through it. My philosophy professor would always tell me, "Alyssa, frustration means you're learning. You're stretching your mind." I can tell you that every time I left his class, my brain was entirely stretched and I didn't always feel awesome about it. Thanks Chris Bocklage! As we move into the marking period, the students are working on multiple projects at one time. Again, they are having a tough time because they aren't sure how to navigate and balance these projects even though we have gone through multiple smaller scale projects which modeled the various steps and approaches. The format for the course is structured, but not in the way that I give them a task in which I already know the end result. The hard part for them is honestly the scary part for me... I have no clue how it will turn out. But what I do know is there is going to be a lot of learning forward and failing forward. Beyond the Design Thinking approach, I want the students to start working on skills they will be able to use in the real world. Being balanced (LP characteristic) and managing workload (ATLs) is a real life skill. I am not asking students to do something that I am not doing myself. Students see that I am constantly juggling several projects at once. From being someone who addresses inquiries to working on building goals with teachers. It's a lot of work. Good work. I'm passionate about building relationships and helping to provide rich experiences for students. As I am leading by example in my efforts to try to be balanced and project manage... I am hoping that they see something more important than being efficient at balancing and managing tasks. I hope that they are developing an understanding that the work becomes more meaningful when you are passionate about it. Because when you love what you do and are doing real meaningful work it gives you a different perspective. The job becomes less of a 9-5 and more of a piece of who you are. What are some skills in which you are naturally good at, both in your personal life and in guiding your students? What are some skills in which you need more work on? How can you work on these skills and also help students work on these skills?